Cold Arctic air has combined with moisture moving over the Rockies to give Alberta a taste of winter in late summer. Forecasters say northern Alberta including Edmonton could receive at least 8 cm snow with up to 15 cm in Jasper. Temperatures are hovering near or slightly below freezing with a plunge to -6°C in northern British Columbia. Environment Canada says more seasonable weather is not expected to return until early next week. The northernmost city in North America with over one million residents had 5 cm of snow today. 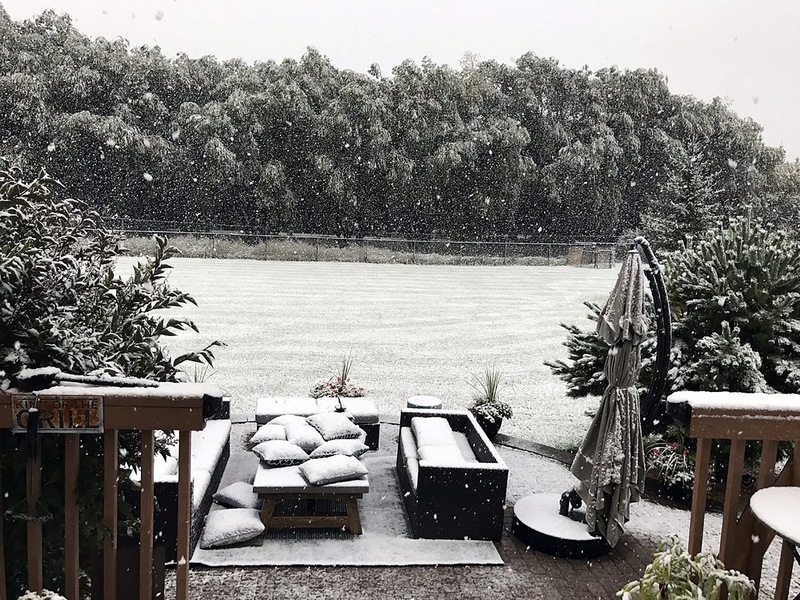 Edmonton had a winter-like day during the final days of summer when a cold rain turned white making highways slippery. Alberta weather can be highly variable given that on 07 September, the provincial capital climbed to 32.8 C – the warmest temperature so far this year. Environment Canada says the cold and snow will be short-lived with sunshine and daytime highs climbing to 16 C by the weekend. Most trees have now lost their leaves in Greater Moncton – with oak trees being the exception – and the starkness of November is settling in. The thermometer dipped to a frosty -3.1 C yesterday morning which was the coldest low so far this fall and a chilly high of only 4.5 C.
It’s a different story in the Prairies and northwestern Ontario with record breaking warm temperatures climbing near 20 C which is well above normal. Edmonton climbed to 20.6 C on Friday which was the warmest high ever for a November day in the Alberta capital. Apart from RCMP officers on patrol, the city of Fort McMurray remains a ghost town after wildfires forced almost 90,000 residents to evacuate. Thousands who fled north to oil sands camps found themselves stranded since Highway 63 is the only route south. RCMP are leading vehicles in convoys heading south through empty and burned out areas of Fort McMurray to evacuation centres as far south as Edmonton. Wildfires have grown to cover 1000 square kilometres of northern Alberta and officials say only rain and cooler conditions will help temper the flames. The largest mandatory evacuation in the history of Alberta is underway as more than 80,000 people flee Fort McMurray due to a raging wildfire. The forest has been tinder-dry and weather has not been cooperating for firefighters either with strong winds, soaring temperatures and low humidity. The fire had entered the city limits by mid-afternoon and social media reports say homes, a trailer park and a hotel were engulfed in flames. The airport remains open and officials say the city’s only hospital has been successfully evacuated. Residents are being told to head north to the oil sands camps or Highway 63 south with evacuation centres on the way to Edmonton.